I saw something advertised on Facebook (yen, I know) called Speed Fix Tool (http://speedfixtool.com/) that is supposed to work wonders on speeding up your computer. These things are usually either too good to be true or they are products that want to load bad stuff on your computer for their own gain. I thought I would send it to you to see what you think. I have to confess that I am behind on emails (way behind) and have not checked the last few Cloudeight InfoAve emails 🙁 yet. But, I did a quick search on them and didn’t find this mentioned. Thanks much and keep up the good work. Hi Mary, thanks. We’ve said more than once if a program has the words “speed”, “tune-up”, “fast” in its name, and promises to speed up your computer or make it run like new or some other ridiculous claim then there’s a 100% chance it’s snake oil; it’s like the diet pills that let you eat all you want, whenever you want and still lose weight. It ain’t going to happen. Here’s what we know: If there was such a program that could miraculously cure ailing PCs Microsoft would include it in Windows – that’s for sure. Instead, since Windows ME, Microsoft’s best attempt at repairing broken/slow computer has been System Restore — not exactly a miracle speeder upper, but a good tool to recover from many problems. In Windows 8x they introduced System Refresh and System Reset. What System Restore, System Refresh, and System Reset have in common is that they all take your computer back to a time before the problems started — the don’t speed up Windows, they don’t by design fix anything — simply restoring, refreshing, resetting your computer to an earlier time or reinstalling Windows may well “fix” the problem. Whether or not the SpeedFix tool you write about contains malware or not, we don’t know. What we do know is that the chances it will speed up your computer are about the same as a bottle of vitamins will make you feel 30 years younger. It’s not happening. 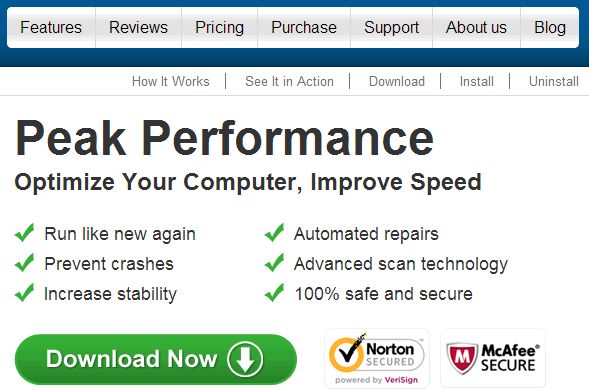 Let’s take a look at the promises SpeedFix makes – but first notice the “McAfee” and “Norton Secured”. What does this mean? Nothing. Can you pay for Norton/McAfee’s “Secure” seal – why of course you can! This is supposed to give the program credibility and make a potential user feel at ease – just another bit of snake oil leading the consumer down the slippery slope of being scammed. Let’s take these one at a time. Nothing is going to make your computer run like new again unless you reinstall Windows, use the recovery partition to take your computer back to the state it was in when you bought it, or have someone who knows what they’re doing go through your computer and eliminate all possible causes of slowdowns. If there were miracle programs available that could fix problems with the click of a button, there would be no repair shops, no online repair services, and no one’s computer would be running poorly. If you could just click one button and make your computer run like new again, Microsoft would include such a program in Windows. Period. Prevent Crashes? That’s a broad statement. Program crashes have many causes; no automated fix-up program is going to prevent crashes. Increase stability? How do they define stability? How do they define instability? Software conflicts, malware, missing or corrupted Windows file and a host of other things can cause a computer to run poorly – but what is stability? Automated repairs? What does this repair? Everything? Certain things? This company paints with a broad brush. 100% Secure — There is nothing on the Web and no program that is 100% secure. If things could be made 100% there wouldn’t be credit card theft or hacking of Target, Home Depot, etc. No such thing as 100% secure. Snake oil salesmen have been around for hundreds of years. The only difference now is we have digital snake oil salesmen. There’s always someone out there preying on people’s weaknesses and telling them what they want to hear. We have fixed thousands of computers since we started Cloudeight Direct and we wish there was some magic elixir we could apply to people’s computers and fix them in five minutes instead of spending hours fixing a PC so it works right. There’s no such thing and it requires expertise, skill, patience and perseverance to repair PC problems. The claims some programs make are sheer fiction but no one regulates these claims — so any company can claim anything they want. THE LICENSED SOFTWARE (EXLUDING (sic) THE MEDIA ON WHICH IT IS DISTRIBUTED) AND ALL PROVIDER RELATED WEBSITES AND SERVICES ARE PROVIDED TO LICENSEE “AS IS” AND “AS AVAILABLE,” AND PROVIDER AND ITS SUPPLIERS AND LICENSORS MAKE NO WARRANTY AS TO THEIR USE OR PERFORMANCE. PROVIDER AND ITS SUPPLIERS AND LICENSORS MAKE NO WARRANTIES OR REPRESENTATIONS (EXPRESS OR IMPLIED, WHETHER BY STATUTE, COMMON LAW, CUSTOM, USAGE, OR OTHERWISE) AS TO ANY MATTER INCLUDING WITHOUT LIMITATION: QUALITY, AVAILABILITY, PERFORMANCE OR FUNCTIONALITY OF THE LICENSED SOFTWARE OR ANY RELATED PROVIDER WEBSITES OR SERVICES; QUALITY OR ACCURACY OF ANY INFORMATION OBTAINED FROM OR AVAILABLE THROUGH USE OF THE LICENSED SOFTWARE OR RELATED PROVIDER WEBSITES OR SERVICES; ANY REPRESENATION (sic) OR WARRANTY THAT THE USE OF THE LICENSED SOFTWARE OR ANY RELATED PROVIDER WEBSITES OR SERVICES WILL BE UNINTERRUPTED OR ALWAYS AVAILABLE (WHETHER DUE TO INTERNET FAILURE OR OTHERWISE), ERROR-FREE, FREE OF VIRUSES OR OTHER HARMFUL COMPONENTS OR OPERATE ON OR WITH ANY PARTICULAR HARDWARE, PLATFORM OR SOFTWARE; NON-INFRINGEMENT OF THIRD-PARTY RIGHTS, MERCHANTABILITY, INTEGRATION, SATISFACTORY QUALITY, OR FITNESS FOR ANY PARTICULAR PURPOSE, EXCEPT FOR, AND ONLY TO THE EXTENT, THAT A WARRANTY MAY NOT BE EXCLUDED OR LIMITED BY APPLICABLE LAW IN LICENSEE’S JURISDICTION. It’s sad that this company probably has made more money with this scam in the last six months than we’ll make in the next six years — but no one ever said life was fair. Mary, if you believe your computer needs “speeding up”, buy a Cloudeight Direct Computer Care key. http://thundercloud.net/direct/ It’s definitely not a scam, it’s trustworthy and safe. As far as I’m concerned, the last place in the world I would look for so-called “PC Repair” would be an ad posted on Google, Facebook, or anywhere else that permits placing 3rd party ads. If TC or EB’s assessments and fixes don’t give you the desired result,, they’ll tell you why it couldn’t and advise you what your next step should be. thank you – this is such a rip off – i have no idea how anyone could fall for it. I am writing on behalf of SpeedFixTool. We are a legitimate vendor and the product does not contain adware/malware/spyware/viruses. We have been receiving positive feedback from our customers and they like it, and they continue using it. We admit that we receive more negative feedback than positive however there is one major reason for that – people have negative expectations towards PC optimization tool as there are many bogus programs out there, and they tend to bad mouth us without even running the program. Between, ThunderCloud.net did this too. We tested it and your claims are false. If you’d like to go to court over it, that can be arranged. Oh that’s right –your terms of service don’t allow anyone to sue you. Too bad. You’re just like all the other one-click-does-it-all scams. If you like, we will prove it by showing exactly what it doesn’t do. Prove you’re not a scam. Even your TOS is a scam. You scammers are “Legitimate”, except that you’ve done your best to hide your company’s actual home base. Your warranties and license agreements ensure that if your product does nothing, or in fact causes more problems that you’re not liable and will not provide any relief. Yeah, right, I call bull*** on you people. I’m sick of having to undo all the evil you and programs like yours have done to my clients’ and my friends’ computers. Why then was there embeded viruses which tried to download data from my computer? Hmmm embedded viruses, huh? And what program told you you have “embedded” viruses? So you’re saying that one of these scams fixed your computer, is that what you’re saying. Do you know how many scams say you have viruses and malware and registry errors – thousands of them and if you buy their program they’ll fix them all. If you fall that kind of scam marketing, I’m sorry. You’re wasting your money. The errors/viruses/etc. never existed so they’re easy to fix. I have had speedfix tool for over a year and I am sure now that it does nothing, It actually slowed my system. I removed it completely about 3 weeks ago and now my system is running at the proper speed. I had a major job removing it from my Registry as the exe file was not deleteable. I eventually got rid of it in Safe Mode. My initial notification of a problem was the exe file had viruses in it and caused havic till removed. Do I recommend the sppedfix tool!!!! you can guess my response. By the way just for interest I own a computer company so I do know a bit about how a computer should perform, The program seams to take control and not let you uninstall it. Because of the viruses in the exe file it will not uninstall properly. Delete all the registry enteries relating to it in safe mode. I did pay for 2 years so be it my loss, learning curve not to trust any program that does things and does not let you control it. Install it at your risk and detriment. I sent a message to their support team asking why they are not answering infoave questions. I’m awaiting a reply. and I will show you HOWWWWWWL. Thanks for the heads-up. I always check these types of offers, and this one Speed Fix Tool looks like all of the rest. Last chance I took on a tool was MWBytes from the last decade (updated of course) and that magical piece of software has served me well. MWbytes is one of the few that are not scams. I participate in an annual cyber-security competition at my school and we always use malware bytes on our virtual machines, and it always scores us points. Another good one we use is AVG antivirus. You can get avg webtune up for free as well if you put in an email address. I have a fake email address I use when I sign up for things like that and I highly recommend it. You can actually do the things the web tune up does for you just on the computer and going around the settings, but that takes much more time. I forget what we use for our linux based virtual machines though….. I hate to disagree with you despite your cyber-security competitions. Malwarebytes crawled in bed with some PUP makers years ago…in fact we used to recommend it highly. Suddenly we notices it wasn’t detecting very many of the obvious PUPs which we knew from experience were either adware, spyware, browser hijackers or home page hijackers. AVG is so bad now that it’s bordering on being malware. Not only does it have very poor detection rates for malware and PUPs, it tries to hijack the users search engine, making it at the very best, a search-engine hijacker. It’s system optimization is a real joke is more show than a useful tool. Antivirus security companies should be concentrating on protecting users’computers – not in figuring out how to squeeze money out of its free version – from what we’ve seen lately, they’ll stoop as low as they need to to extract a nickel or a dime from users searches and by selling captured user data. We see hundreds of computers each month – thousands each year. We see AVG-protected (combined with Malwarebytes in some cases) loaded with malware such as hijackers, PUPs, adware and spyware. We’re not making this up. Please take time to read this. These are facts you can’t ignore and much of it pertains to AVAST and AVG. Could you please support (a.k.a. -document your findings; please)? Short of the software obviously not being able to find/know\be aware of all malware at all times (obviously impossible)… you are actually leveling a fairly serious accusation that they are intentionally not detecting malware from (“some” companies). Quote again “crawled into bed” –> I’m not sure if you mean to imply quid pro quo or $$ was exchanged for lax detection – I can’t really think of any other reason a company would otherwise be inclined to do something like that other than money or some type of gain. However, just trying to think logically about the full path and all the ramifications of what you are alleging. I don’t know of a single open source or hacker based group that has EVER leveled an accusation like that against Malware Bytes (intentionally not detecting malware) – so I’m eager to please see the data posted (perhaps a white paper) of which companies / which malware types that this company is to be accused of INTENTIONALLY letting remain on systems. It should be relatively easy to document. We attempted, several times to give Malwarebytes a chance to explain why they stopped detected some of the worst PUPs (Conduit, Ask Toolbar, etc.). They chose to ignore our emails. Once of our readers wrote them and they did answer her (which you can read by clicking the last link in the list below). Their answer to her was they can’t help it if people don’t uncheck boxes and allow PUPs to install because they’re essentially giving Conduit, Ask and other PUPs permission to hijack their browsers, searches and home pages. However what they don’t explain was – why did they always detect Conduit, Ask and the others before as PUPS. We could only conclude that some sort of payment or arrangement was made between Malwarebytes and Conduit, Ask and others — or that they had been threatened by these companies with lawsuits. We don’t know why but “crawled into bed ” is a good metaphor. We have worked on several thousand computers from all over the world; we have a basis for our claims. And you know what else? We have never heard a word from Malwarebytes – not then, not now, not ever. If you think we’re publishing false information, why then hasn’t Malwarebytes asked us to retract or threatened to sue us? Not once have we heard anything from them. Do you work for Malwarebytes or do you sell it for a commission? Something doesn’t seem right with your defensive attitude. I was doing fine reading this post. Then I had to stop because I was laughing so hard when I got to the part where you wrote “Antivirus security companies should be concentrating on protecting users’computers – not in figuring out how to squeeze money out of its free version”. Corp. America cares nothing about the consumer. The only concern they have about the consumer is how much money they have but I see where you are coming from. What a shame technology has turned into. For every good there is an evil. Just my opinion. Yep! That was my experience with AVG. Screwed up my computer. Don’t use anymore and it’s been approx 1 1/2 to 2 years. AVG used to be good (served me well) but it’s been sometime now they turned BAD and nothing but Trouble! AVG Free has been serving me fine for years. It’s all in how you set it up. If you’re one of those who clicks install, and leave it at that, then yes, you will get pissed at the application. Check the Options> Advanced Settings. There’s a lot of settings you can do to make AVG work quietly and minimize intrusion on your computer use. Well, I can see why there’s so much malware and trickery. It’s okay with you as long as it doesn’t affect you. It’s unbelievable that anyone could condone AVG’s behavior trying to trick users into installing the very kinds of garbage a good Antivirus/Antimalware would remove. And AVG is a mediocre antivirus and it’s antimalware/anti-pup features are laughable. I can see why the web is like it is when people have attitudes like yours. It doesn’t matter what kinds of trickery or deceit a programs uses to install other programs, as long as you catch it. So those who get infected, according to your world view are either lazy or stupid. I would love to look at your computer and see how much malware and PUPs on it. I bet I’d find a bunch. Then what would you say? You weren’t careful? You didn’t watch every dialog? I think your attitude is a good example of how the world is today – if you’re poor it’s because you’re lazy? Is that how the world is? ROFL this is awesome ! Someone finally telling you ******* off. I am tired of these scams to (fix and speed up my computer) only to have yet another thing to find and delete after 30 minutes of my time wasted doing downloads, scans etc. These companies ought to have to pay back money get fined pull their license and GO TO JAIL! You **&!!**! Wow, am I glad I stumbled across you guys just as I was about to, against my own better judgement, and despite all the problems and heartache caused by the crapware I’ve wasted my money and time on over the years, download SpeedFixTool. Thank you for setting me straight, and preventing me from being a fool. Again. I am always on the look out for utility programs for, computers. I checked this out on the surface and the first thing that comes to mind is a registry cleaner program. Now I know that there are registry cleaners that will fix broken shortcuts and all that cause by many stupid things we users do either by accident or on purpose. I personally will not use this just because they Claim to be able to do more than is likely. If it walks like a duck, and it quacks like a duck–it’s a SCAM. As a PC tech, I totally agree. To see or hear “My computer runs faster than ever” makes me cringe. The only way it can run faster than ever is with hardware upgrades. Even upgrading the OS often times will create problems without hardware upgrades. I would like to see these offerings go away, but it brings in business for me. Best Answer: PC Fix Speed claims to be a system optimizer capable of increasing your computer’s speed and repairing computer errors. The truth is it is not a legitimate program but a scam. It gets inside a computer using various tricks, such as social engineering or bundling it with freeware. If you see an advertisement informing that your computer runs slower than it should and click on it, you might get infected with a trial version of PC Fix Speed. Once installed to your computer it will start scanning it and display all sorts of warnings with the only purpose to convince you into buying a full version of it. A free version of this fake registry cleaner cannot be removed from Control Panel Add and Remove Programs list unless you purchase its complete version. No legitimate application would force a computer user to do so. Another point proving it is a scam is PC Fix Speed scan results. They are clearly exaggerated where some of the problems don’t even exist or are common for every system and do not hinder its work. http://www.2-viruses.com/remove-pc-fix-s… << Text gotten from this site. Whoops, I see that I stuck my foot in my mouth and posted something regarding another piece of crapware. My apologies. I’d say to take my post down, but it may save someone down the line, even if it is about another product. Man thank you for your website if I had known that you were around I would have asked questions long ago. Yep came across this website the other day speedfixtool and it seemed to good to be true and I found your site and made me really think to beware and do your research. No I did not download this software and thank you for your input to help my old computer run free of junk. If by chance you find a good software that will clean all the old B.S. off of a computer let me know. You question whether SpeedFixTool is malware; it contains a PUP that is a variant of MSIL/Rebrand.LittleRegClean.E that was detected by Eset’s NOD32 as a Potentially Unwanted Program threat and terminated the download. DO NOT DOWNLOAD. Any software producer or provider who attempts to download and/or install a program YOU DO NOT specifically grant permission for or is a “threat” on any level is NOT to trusted. No sir we didn’t question if it was malware, we told people it was a scam too. 1. Make note of which software you use regularly and locate installation files and/or source. 3. Completely reinstall your operating system from original disks/original backup. 4. Apply system updates (usually via automatic update function) and anti-virus software and associated updates. 5. Reinstall ONLY the software you use regularly and know to be reliable. Thought this was a scam, if is it too good to be true it usually is. I have used AVG and it worked better in the past, it is annoying how it hijacks. Norton and McKaffee always seem to be running and use up gobs of memory and have always slowed my computers down. Malwarebytes removed some Malware that nothing else could catch. I think Advanced System Care works great for me. What do you use to scrub your computers? I will have to remember this site ThunderCloud.net , you seem pretty legit! I remember when we were doing Voice Video and Data across ISDN lines and we thought 1MB per minute was great. When I was in College we had to work on Main Frames PDP 11’s and Vax. Things have come a long long way in a pretty short period of time. I work with tons of applications and they are all buggy! What happen to QC and Testing? What’s Next! I think someone needs to create the killer Middleware. I digress! I decided to buy speed fix tool because heard so many good things about this product. maybe its a scam what do you think.even they have a 30 day guarantee refund ?. We tried to warn you, Sydney. SpeedFix tool is a scam. Rather than trying to get your money back from the scammers, just call your credit card company and tell them you scammed and they can take those charges off your card. You did use a credit card, right? Thanks for the blunt responses you’ve given on this post. They’re refreshing to someone who’s been working on computers over 20 years and has literally seen it all. I warn people all the time that if something is too good to be true, its not worth the money and to just do it the right way (which usually only costs time). I loath these fly-by-night programs that have gone so far as to advertise on television with people that claim their computers “run like new” and are “faster than the day they bought them.” I use the metaphor of a vehicle: Would you buy a fuel additive that made your 4-cylinder run like a 6-cylinder?” Of course you always say No, well, these programs are like the fuel additive, it just won’t work no matter how hard you wish it to. Applaud your effort to educate people, however some of the responses you’ve received tell me its falling on deaf ears. To the people who claim these programs work, I got a bridge for sale, real cheap. I’m glad my debit card had no money on it. I was about to fall for this scam and I’m glad I didn’t. That was a close one. All told anything that says free and then says oops only this bit is free is bound to be a scam.I must admit all the stuff on their page defending their honesty and apparent attempts to refund money to unhappy customers does seem to make them look legit.When you look at their replies though you see a customer says no money refunded but ALWAYS they say our records show and they even politely put in an exact time it was refunded. Thanks for this very useful info. As a user of AVG what antivirus software should I be using? I really wish that I had seen this discussion board a few weeks ago. I am a totally disabled senior, with so little computer experience, and technical knowledge, about computers. I spent very needed funds to purchase some of these “computer fixes”. I went online, and came across what was supposed to be, the Ultimate PC Booster and repair program, “scam”, (but I didn’t know that at the time). My computer freezes up, and has to be constantly refreshed, on any page I’m on. The only thing I do on my computer, is check my emails, look at E-bay, and sometimes I search for information on other things. I purchased a program called, “System Booster Pro”, and after I paid the $9.95 fee for the program, I had to call them, just to register the product. Once I got them on the phone, the young man said he needed to access my computer remotely, to do what needed to be done. I thought at the time, it was because he knew more about computers then I did, but now I’m sure that there is something else on my computer, that is bad, because it is actually worse now, then it was before I purchased their program. He was going so fast, that there was no way I could tell what he was doing. He showed me thousands of things that were on my computer, that he said was slowing my computer down. They were supposed to completely clean my computer, with the first purchase of the program, but that never happened. The young man I originally spoke with, transferred me to another technician, that was supposed to do the computer cleaning, and explain how to use the system myself, to keep it clean. That technician, rudely, declined to clean my computer, because he said that I did not have an anti-malware, anti-virus, program on my computer, (which I did have). I was then transferred to a supervisor, and he told me that in order to get my computer working correctly, I needed to pay a $249.00 one time fee, and $9.95 a month, and they would remotely keep my computer clean, and running like new, for life. There was no way I had that kind of money, so I couldn’t do that, but they just kept pressuring me, about the other needed programs, (which was another $89.99 and $69.95), and then I would never have to worry about my computer running slow again. I’m glad I didn’t have the money now, but if I would have had it then, (before reading all this), I would have probably paid it. Needless to say that program does not work at all. A few days later, I purchased another program called, “Total Defense PC Tune Up”, for another $9.95, (which makes almost $20.00 for the 2). Just that little bit of money, makes me miss out on a couple of medications I needed to get this month. I probably wouldn’t have minded, if at least one of the 2 programs purchased, did what they said they would do. So now I have 2 useless PC repair programs on my computer, I’m out almost $20.00, and my computer will hardly work at all, (it’s definitely worse now then it was). I was actually looking for another type program that might help out, (but this time free ones), when I found this. I looked at several reviews, and I have been thinking about downloading a program called “Ccleaner”. After reading all these comments though, and what has already happened to my computer, (from the other 2 programs I downloaded), ((that I had to pay for)). Do you think I should I download this “Ccleaner” program and give it a shot? I definitely can not afford to pay for anything else, and it said this program is free, but now I’m afraid I’ll just get more junk on my computer. I don’t know what version of Windows you have. We are both sorry you were scammed. A good rule of thumb is – anything with Turbo, Speed, Tune-up or Boost in it’s name – or anything that promises a one-click fix — is almost certainly a scam. If you could tell us what version of Windows you’re using, we will try to help you or at least steer you in the right direction. One more thing: If you used a credit card to pay for those two $9.95 programs, you may be able to get your money back. I ran across your site while looking for reviews for Speed Fix Tool. I read through all the posts…thumbs up. Now i have a question…We currently are using the free Avast anti-virus program…if I read and understood correctly this is not a good choice? Is there a better choice out there? Looks like I’m gonna have to do a system restore and make my computer stupid as my husband likes to put it lol. If you’re looking for a so-called “Free” antivirus – you have two major choices – Avast and AVG. Neither protect you from hijackers, PUPs and the kinds of malware you’re most likely to encounter. It’s highly unlikely you’ll ever encounter a virus these days. Additionally, AVAST and AVG try to monetize their “free” software by hijacking your browser (search engine and/or start page) as well as sometimes attempting to install unnecessary junk (particularly AVG). Those two companies would be more honest just to sell their software for a reasonable price rather than trying to make their users a source of revenue. We recommend Emsisoft – not only is it one of the top-rated antivirus programs (according to independent testing labs) it also protects you from the things you’re most likely to encounter: hijackers, pups, and ransomware. We have swapped Emsisoft for AVG and AVAST on dozens of computers and most all of the time we find the computers protected by AVG / AVAST free from viruses but full of PUPs and browser hijackers and other annoying toolbars etc. I am sorry to admit i fell for this( speed fix tool plus ) yesterday payed them $50 using my Credit Card ( i know i did everything wrong ) they said they would clean out my computer for an extra $90, my concern now is can these people be trusted not to use my credit card any time it suits them, i am thinking about going to the bank to get them to change my card details. Call your credit card company and tell them you want your money back – tell them you were scammed. They will reverse the charge for you. I don’t know if you need to change your credit card number and info – that’s quite a lot of work – ask your credit card company what you should do. Maybe you could have them send you a text alert or email alert every time your card is used. I have the with my debt card. I know the minute it’s used. which had a link to this page on thundercloud. Thanks so much. I’m very grateful. However I’m trying to delete the downloaded programs and it’s very hard to delete them. It keeps saying the folder is open in another program. But now I think it’s gone, just the folders remain. I hope so anyway. There are no files in the folder (unless they are hidden somehow) There was another file which I deleted using shift & delete. I know I only downloaded the program, i didn’t click to install it. Maybe it did it itself somehow. I hope not. thank you for this comprehensive page. i almost believed the advert and i usually know what I am doing. i used to use trend micro anti virus ,a and would appreciate any comments on it. I plan to install emisoft and trial it based on your experience. to any readers who have got in a mess, search your system for system restore and then go back to the earliest restore point time you can restore from. You will then need to re do the upgrades. anyone got a clue about that ? What a bummer we didn’t find you first, we did download it, and paid for it, promotional price of course, only to have our computer begin to get slower and freeze up while the wretched program did it’s thing, plus, I might be imagining this, but space is getting a bit less with each run it does. My, such good reviews it gets out there, a bit like old tinnitus ……. which to date has done nothing and seems only to have made it worse. Such great reviews they got as well, only took me a one and 1/2 programs to realise that THEY only put positive stuff out there. I will be doing more in the research department in the future, rest assured. Now I am off to try and uninstall this useless program and say goodbye to my money, a lesson well learnt when it costs you.